Inspire your supporters with memorable digital advocacy petitions. Spread the reach of your digital advocacy campaign with social media tools. Optimize your digital advocacy with intelligent data. Galvanize your digital advocacy campaign by leveraging targeted actions. Spreading the word about your mission and effecting real change is as simple as optimizing your digital advocacy strategy. Let’s dive into these top tips (and even see some examples of successful campaigns)! 1. Inspire your supporters with memorable digital advocacy petitions. One of the best ways to boost the impact of your community is by making the most of digital advocacy petitions. They can help grow your community. Because advocacy petitions exist online, they can be shared across digital channels like email, social media, and more. This means that not only will they reach your go-to advocates, but they’ll also introduce new supporters to your cause. They can help define your identity. Digital advocacy petitions are excellent tools for letting the world know about your mission in your own words. Since these petitions are completely customizable, there’s nothing stopping your form from making a powerful impression on all who encounter it. They’re data driven. Another benefit of online petitions is that they let your organization collect meaningful data on your community of supporters. With these kinds of insights, you can more effectively keep up with supporters after the campaign ends and optimize future petitions based on what you’ve learned from past campaigns. Think digital advocacy petitions are right for your organization’s outreach strategy? 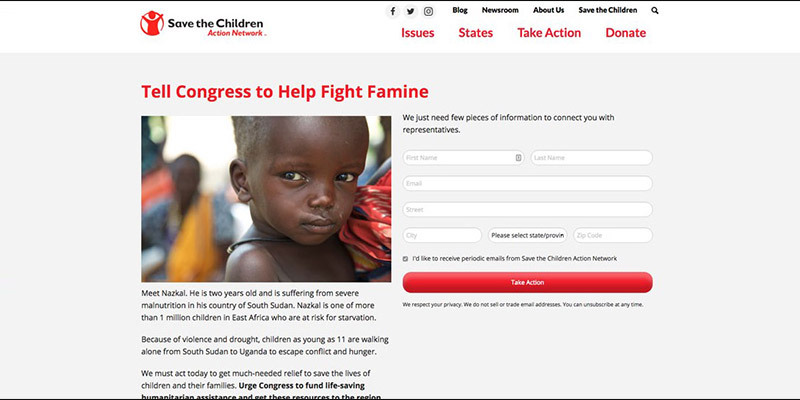 Take a look at how Save the Children inspires action with their online petitions. Include a compelling call-to-action in your petition’s title. Keep the body of your petition succinct and clear. Remind readers of who your organization serves with inspiring visuals. Be sure to feature your logo and branded color scheme. Make use of your “Submit” button’s real estate with action-oriented language. Bonus! Want to find out more ways to maximize your advocacy organization’s online petition? Check out our 5 Smart Electronic Petition Tips to learn how you can create effective forms with online petition software. 2. Spread the reach of your digital advocacy campaign with social media tools. If your social advocacy organization wants to grow your community of grassroots advocacy supporters over time, this means you’ll have to consider ways to get more out of your social media strategy. Social sharing buttons that allow supporters to share your campaign instantly with their personal networks. Matching tools that help your organization connect a supporter’s email address with their social media profiles. Action alerts that can be shared across different social sites and via email to immediately call your supporters to action. Automation tools that let your team draft, publish, and schedule posts on your various social media platforms. Check out how Organization for International Change makes the most of their social advocacy software by crafting consistent messages that can be shared across their preferred social media sites. 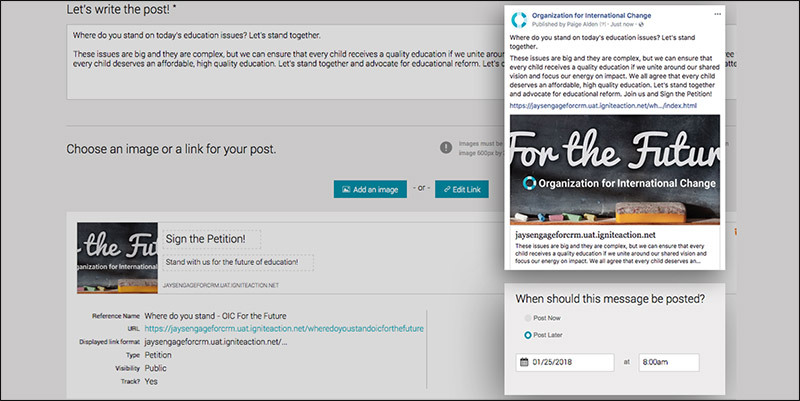 Just like with your organization’s online petitions, your social posts should be succinct, visual, and drive your supporters to action on behalf of your cause. One social media strategy that some organizations overlook? Peer-to-peer fundraising is a great way to get the word out about your mission on sites like Facebook and Twitter. With peer-to-peer fundraising software, you can empower advocates to fundraise for your organization’s latest campaign while simultaneously introducing scores of new supporters to your advocacy efforts. At the end of your next campaign, you won’t simply have reached your fundraising goals; you’ll also have grown your community, too! 3. Optimize your digital advocacy with intelligent data. The key to smart digital advocacy campaigns is knowing who your supporters are, what kind of actions they respond to, and how you can turn that knowledge into strategy. Constituent profiles. In your organization’s CRM, you should be keeping rich constituent profiles on each and every one of your supporters. These should include contact information, a history of how they’ve interacted with your team, a map of their relationships with other constituents, and more! Action insights. When your supporters donate, make a pledge, sign your advocacy petition, or otherwise complete an action on behalf of your organization, your software should produce action insights. These help you better understand where you’re going right in your latest advocacy campaign and where you need to correct course. Database querying. Your data means nothing if you can’t access or analyze it. With database querying, team members can search your constituent data to learn about the success of your strategy, the makeup of your constituency and more. 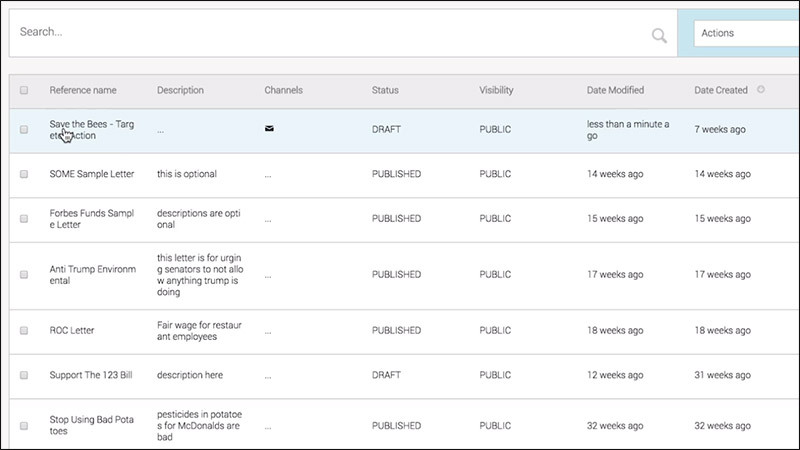 Even better, you can also set and measure metrics for additional insights. Be sure to choose your advocacy organization's constituent database carefully. You'll want to pick a platform that lets your team capture all of the data you need to know about your community, like their interaction histories, biographical data, networking markers, and more. Ultimately, the more robust your database is, the more valuable it will be to honing your digital advocacy strategy. Role-based access to ensure only the appropriate team members can access sensitive supporter data. Deduplication features that help prevent your CRM from becoming cluttered with duplicate supporter profiles. Customized dashboards so that you can curate the data-accessing experience for your team members. Bonus! Need more insight into how to choose the right online advocacy software for your organization? Discover more important advocacy software tips with Double the Donation’s guide! 4. Galvanize your digital advocacy campaign by leveraging targeted actions. Advocacy organizations like yours are at their most successful when your constituents don’t just passively offer their support, but act with your team to effect change. Targeted messaging. With this advocacy feature, your team can draft consistent messages that will be sent out on behalf of your supporters to decision makers like CEOs, legislators, and more. All supporters would need to do is sign your online petition form to make their voices heard! Tweet a Rep/Facebook Message a Rep. Like we mentioned earlier, one of the most powerful tools in your online advocacy arsenal is social media. With targeted social media actions, your team can empower supporters to spread the word about your campaigns to their local representatives via Twitter or Facebook. Personalized interactions. One way to boost responses to your organization’s targeted actions is by personalizing your messaging strategy. By segmenting email lists by different groups within your constituency, you can encourage supporters by name to participate in the targeted actions they care most about. Let’s take a look at how Save the Bees manages their targeted actions with Salsa’s intuitive online advocacy dashboard. Each of their campaigns helps spread awareness for different arms of their mission and is thoughtfully crafted to address the unique interests of their various digital channels. By carefully planning who the actions target, what kind of messaging they promote, and how they are shared, your team will have a better handle over your digital advocacy campaigns. Your team can also customize targeted action forms just like you would for online petitions or giving pages. The same best practices apply here: brand the form to your organization, keep it short and sweet, and always inspire your supporters to act! Figuring out the best ways to connect with your advocacy campaign supporters can be tricky. However, with these strategies in place, your organization is sure to reach your goals!